Polymer Shake – Not Just for Your Roof. Think Siding. We love when our products are used and especially when someone comes up with a creative way to use them – other than for roofing! Many architects, roofers and homeowners have come to us to use our DaVinci Shake for siding. Their goals are the same – they are looking for a quality product that is going to have a longer life than natural shake and without the fire dangers and the pest control. They also like how realistic our shake looks and that the color life is better than natural shake. You'll see how our cedar roof shingles were used on the home to the right – the house has a nice contrast between the cedar shake look and the blue and white siding with a bit of brick. These homeowners like texture and color and it makes for fantastic curb appeal. 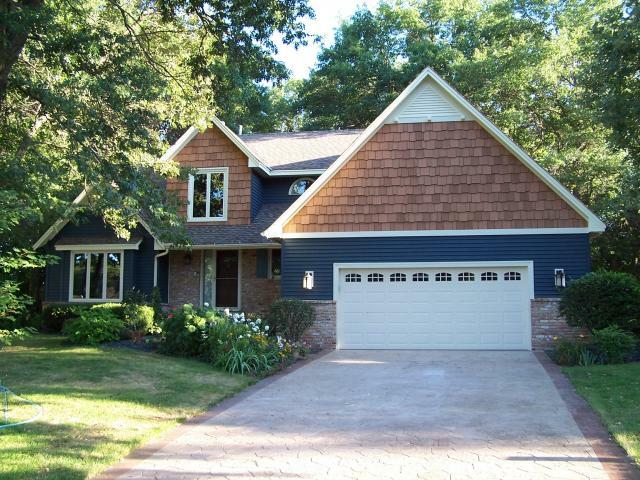 Several other homeowners have also used our shake as siding – click here for photos. Are you looking for a cedar shake alternative for siding? Do you have questions? Please contact us. Have you used DaVinci Slate or Shake as a siding material rather than as a roofing material? We want to see how it turned out – please feel free to share your DaVinci masterpiece by submitting your story here.